Here is a minimalized sketch exploring possibilities of a tilt up dome design. An animation of this building concept , old address-http://www.midcoast.com/~bo/tiltupdome.html Google omits new address- http://harmoniouspalette.com/tiltupdome.html but timing was strngely slowed-down over the years, heh,heh-- struggling artist here, busy with content, bored with animations repairs and html troubles. Tilt up construction allows using the ground as a form for casting cement . The example above explores the simplicity in "tilting up" a very small dome building. A different building method concept is offered for comparison named "ringforcement. Here is a page describing Ringforcement :A synergy of ferocement, concrete, masonry and curved construction. In temperate climates, a translucent roof can work very well as a buffering "envelope" with utility areas intervening between the roof and conventionally insulated rooms below. Another worthy term for this unusual idea may be "solar attic". Besides greenhouse uses and hot water and heat production, the utility of this area includes: whole building ventilation, workshops, drying (e.g: laundry) and recreational uses. 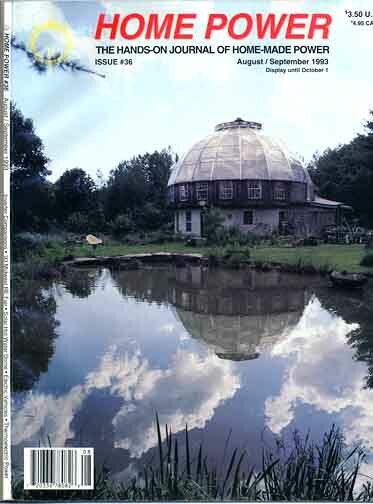 A translucent dome built singlehandedly by author, and some earlier diagrams of all this sketched with an older software program. It might be a question of time as to when technology and markets offer the benefits of "translucent" building components that feature full control of heat performance. A promising material for translucent roofing is "silica aerogels". Currently it is produced in small quantities at high prices which reflect it's under realized promise. A material before it's time since architecture in general has not sufficiently recognized the possible imperative in translucent roofing. (IMHO). News from summer 2003-- http://www.kalwall.com/nano1.htm the worlds first commercial arogel panel, (a bit expensive yet). "Aerogels are advanced materials yet also are literally next to nothing. They consist of more than 96 percent air. The remaining four percent is a wispy matrix of silica (silicon dioxide), a principal raw material for glass. Aerogels, consequently, are one of the lightest weight solids ever conceived. " Pictures and URL link follow below. 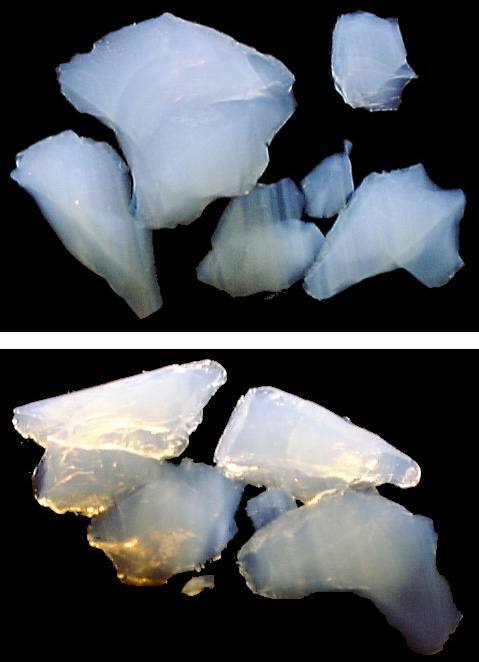 Two photos of silica gel fragments. The first is taken from above, the second at an angle with camera nearly facing the light source, (sun). I obtained these from The Lawrence Livermore Lab many years ago when they were government funded to promote the commercial potentials of the material. The packet which I received contained about an inch thick pile of technical documents and a nice little brick of silica gel. Over the years, the brick chipped away and i confess to my curiosity in testing its breaking strength. My sample was weak. Every one I showed this sample to loved the hint of iridescence. This aesthetically pleasing quality may be one of the eventual selling points of this material. It seems looking back from today, promoters might have well spent some money showing off this aspect in magazines articles of many persuasions to stir up a broad based interest. Within reason it is conceivable that translucent buildings could both control temperature comfort and provide lighting reminiscent to ice caves! This may well transpire eventually, (noting the surprises with technology). CAD animated fly throughs of translucent buildings, using radiosity rendering, might just stimulate interest. (Eventually examples will appear here, or linked to this URL). Silica gel is a stable "foam" of silicon molecules. The fine matrix of silicon molecules traps countless air spaces which make the material light weight and a good insulator. No doubt differing products could evolve beyond the original forms. Here is a very nice descriptive page from the Berkley Labs "Aerogel Research at LBL: From the Lab to the Marketplace" Getting the strength up to styrofoam levels might reduce some of its desirable qualities, but I am optimistic about this technology in the future, despite any thing else. Another URL atNasa on aerogels, click here. I seem to remember some URLs out there describing silica gel technology, (casually found through search engines). Some company was selling silica gel as a special applications, high performance insulation. But it would take a massive industrial effort to make the material viable in the housing market, (as translucent roofing insulation). A separate, small, minimalist but sculptural dome concept. 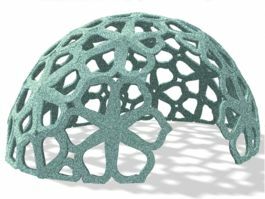 See some CAD sketches using curvaceous meshes. See trickle down solar heat storage concept. See a wilder biaxial building concept. 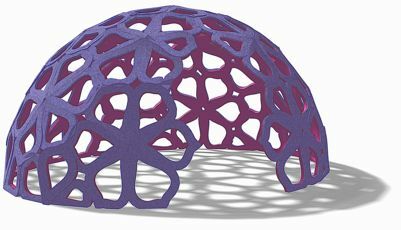 Below: projecting natural shapes into a dome surface as a buildable structure.